I’m unbelievably thankful for finding this recipe on SuperHealthyKids.com! These muffins are the only way I can get Katia to eat veggies right now and the only healthy thing I can get her to eat some days. She loves anything sugary so my trick for this muffin recipe is adding a little sprinkle of sugar on top before baking and adding extra cinnamon to hide the health packed punch of veggies. 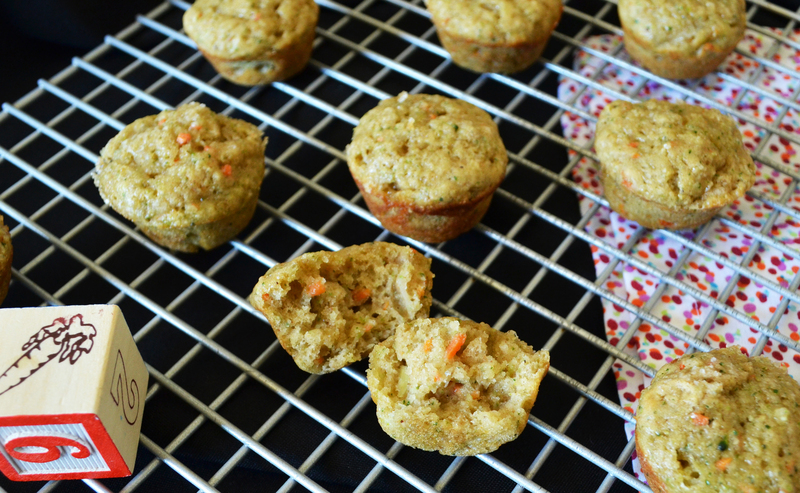 Let me tell you these mini muffins are way too yummy to have all those veggies inside. Definitely a winner in my book, a health muffin that doesn’t taste off putting like so many “healthy” kids muffins. Has anyone ever dealt with food allergies and little ones? I don’t know how we will ever eat out with one child who is severely allergic to peanuts and fish; to make it even more difficult, now the littlest is allergic to any kind of seed oil including sunflower, safflower and flax 🙁 Really hoping they out grow their allergies so that one day we can travel the world with out an EPI pen or a detailed allergy list to hand our servers at a restaurant. Oh and the worst, Katia may have a possible gluten allergy, but not determined yet; if so I’ll be tweaking these muffins for sure because right now they are her breakfast lunch and sometimes dinner. Recently I posted another delicious mini muffin Katia enjoyed, The Best Toddler Mini Muffins, they are so delicious and it’s funny because Max prefers those muffins, probaly because he loves everything pumpkin like his Mama. Both muffin recipes are fabulous and 100 percent freezer friendly. I just pop a couple of muffins out of the freezer every morning or night to defrost, then they are fresh and ready to go every day, Easiest Mom Hack Ever! One update to share, we are currently feeding Katia a wheat free diet to test for a possible allergy. I was terrified to test this recipe out with gluten free flours because I did not want to compromise the flavor or texture. Well, after testing a few different flours out I found the perfect one, Pamela’s Artisan Blend. The texture was just slightly different, but they still tasted awesome. Katia currently eats these Fruit and Veggie Kids Mini Muffins every single day and they are a staple in her diet.